Does a Water Softener really work? Have you been wondering how a water softener could affect your home’s water system? Wondering if they really work? In short, the answer is yes. To really expand on that, if you managed your homes’ water system with a water softener and a whole home filtration system, you could effectively have Fiji water coming out of your taps. Here is a quick checklist of what to look for in your home water system to determine if a water softener or filtration is right for you. Faucets are corroded and require replacement. Cloudy glasses and spotty dishes that don’t look better despite detergent finishing products. You can do a quick water test (with a water test strip) that can give you a good idea of what your water health really is. If your house if over 40 years old, and you are concerned about your water health, you can call Viking Plumbing and we will test your water for you – at no cost to you. Save money on detergents and soaps! Although purchasing a water softener is an investment, you could immediately see that you could cut back on soap usage. After a water softener is installed, you could use half of a scoop rather than 2 scoops of soap. And shampoo? A dime-size amount is all it can take. The financial benefits of water softening may surprise you. For example: If you decided to replace your water heater about the same time you purchased a water softener, you would notice the hot water tank has so much built up sediment. We have seen such build up that it took three men to carry the old water heater out of a garage. Even after flushing it out, the water heater had nearly eight inches of sediment on the bottom of the tank from years of operating with hard water. With the water heater element submerged in the sediment and insulated from the water— I’m not even sure how they ever got a hot shower. Before you get a water softener installed, you may notice low water pressure in your home. After installation, you will notice an increase in pressure. We have opened up shower heads and cleaned out rocks—yes rocks. Pipes are most likely clogged with mineral deposits and scale that reduce your water flow. Soft water can actually dissolve mineral deposits in pipes over time and you will begin to see an improvement in your water flow. As mentioned, Corroded faucets are recommended to be replaced. Faucets can have small holes near the base from the corrosion of hard water. As well you will also notice that secondary filters (i.e. fridge water filters for water/ice dispensers) will also last longer. As well, you will notice that your water tastes better. And that is something we can all enjoy. 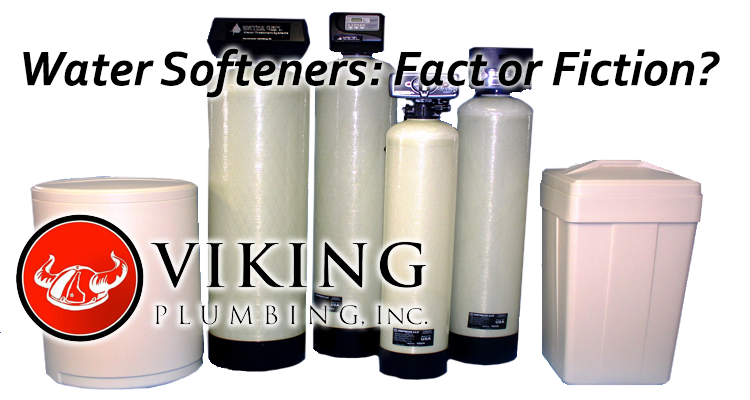 If you would like a consultation on whether or not a water softener is right for you, call Viking Plumbing and schedule an appointment today!